A charming and quaint historic apartment set among beautiful gardens, fruit trees and a Park. A cozy and bright space filled with original works of art, the apartment offers a retreat-like setting for guests. The Bamberger Apartment is part of the historic Bamberger Station Hotel, a now historic center in North Salt Lake. The Bamberger Apartment is conveniently located to downtown Salt Lake City and Bountiful, bus lines, SLC airport and many restaurants. A completely remodeled apartment that retains the character and qualities of the historic Bamberger Railroad Station. A cozy and bright space, the apartment offers a retreat-like setting for guests. Guests are ensured a good nights rest with the bed that features a memory foam mattress. The living room is spacious and comfortable with a full sofa and digital TV. The kitchen is fully equipped, so guests can make a meal when they do not feel like eating out at one of the many restaurants located nearby. Guests will park in the parking lot for the apartment complex and enter through the main entrance to access of the historic building to get to the Bamberger Apartment. Guests also have access to the seating area on a balcony that overlooks the Great Salt Lake and gardens on the property. Guests will self check in when we are unable to meet you for initial entry, and enjoy privacy during their stay at the apartment. We live nearby and will be available to guests as needed. We enjoy meeting new people, sharing our art and Tai Chi, and we honor guest privacy. We plan to offer private lessons of Tai Chi on occasion, so feel free to inquire about joining us for Tai Chi. Additionally, we will be opening an art gallery on the property and guests will be welcome to view artwork. 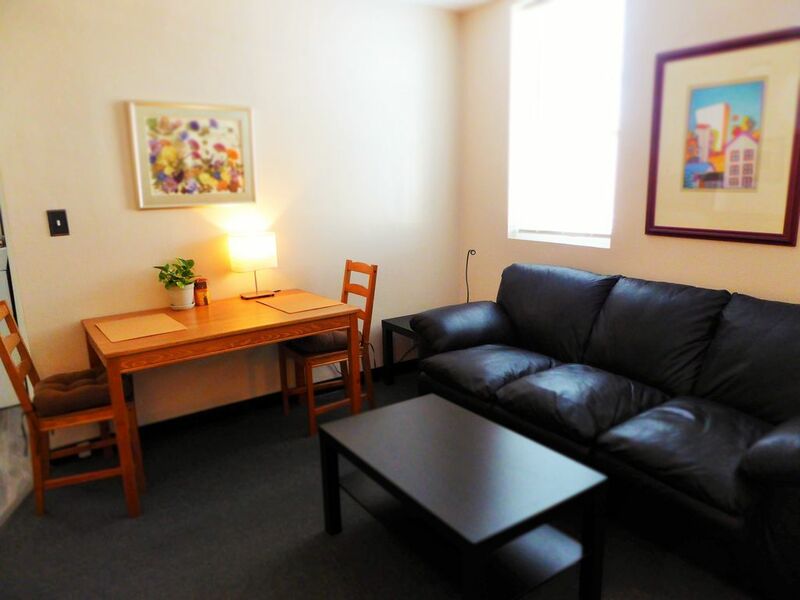 The Bamberger apartment is located in a quiet residential area in the heart of North Salt Lake. The hotel is surrounded by Hatch Park and beautiful gardens and fruit trees on the property. Hatch park, located nearby, has tennis courts, field track and a playground. Within a few minutes drive, you can reach the Legacy Highway trial where you can bike or run for miles along gorgeous landscapes. The neighborhood has a great place for breakfast located only a few blocks away, grocery markets and many well-liked restaurants are within a 5-10 minute drive to Bountiful and Salt Lake City. Major bus lines are located only one block from the apartment, and there is easy access to the highway from the apartment. Downtown Salt Lake City is only a 10-minute drive and you can arrive in Bountiful within 5 minutes. The airport is conveniently located only 15 minutes away. large comfortable leather sofa with coffee table. fully-stocked kitchen with microwave, toaster, coffee maker, pots and pans. Dinning table for two. Beautiful oak dinning table for two. small lawn area off the back deck. My husband and I love staying at either of David's apartments in North Salt Lake City. Always spotless, comfortable and so incredibly reasonable! Larry who is on site to take care of the rentals is always so friendly and a joy to talk with. Thank you for a great stay once again! Always love staying here. It’s spotless and a great location for traveling around the Salt Lake City area. Good food options nearby as well. Clean , accommodating and safe feeling. Thank you!!! Excellent stay and wonderful communication and friendliness. Great host. Great place. Communicated well and accommodations were great. Highly recommend, especially at the price. Cute apartment with nice accents, thoughtful touches. It was nice to have coffee, bread, eggs, fruit, etc available! The only negative would be the noise outside. It was louder than we had expected and it was hard to hear the TV over the cars and we did not want to turn up the TV too loud to disturb others. It was quiet late in the evening and so we slept well.